Describe some theories and studies regarding effects of color on the psychological, emotional and physical health of people. Recognize the ways color can help with safety, orientation and navigation in a healthcare facility. 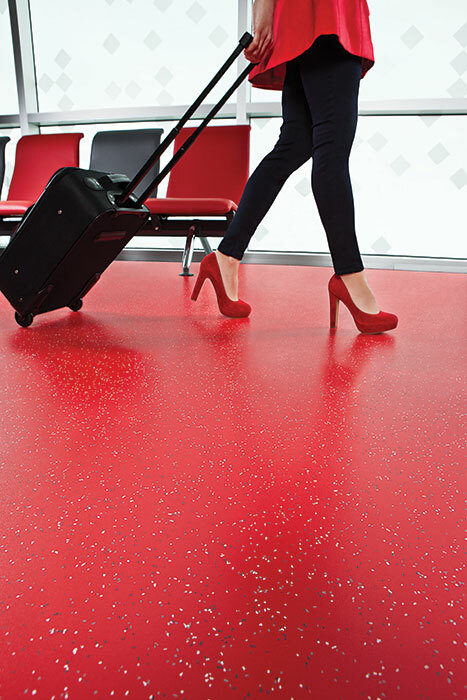 Summarize how low-VOC rubber can offer optimal flooring solutions for health care institutions. 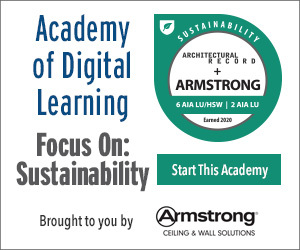 Color is a strong and integral part of both our natural and built environment. People experience color in different ways and in different settings often reacting subtly or overtly to its impact. In particular, people in health-care settings who are vulnerable, healing, or aging have been understood to be influenced by colors used in interior design. It is not surprising then that a fair amount of research and inquiry has been undertaken on the use, role, myths, and impact that color can have on people in health-care settings. 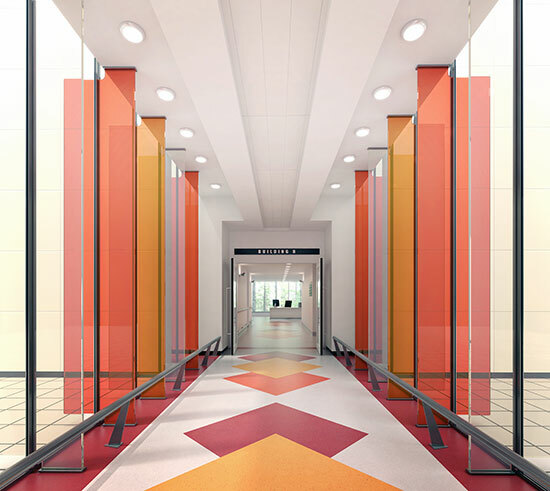 By learning from these studies and applying the knowledge gained about the role that color plays in health-care environments, designers can create spaces that better meet the needs of patients, staff, visitors, and other users. In addition, some of the misunderstandings and myths about color in health-care environments can be cleared up to clarify what really does or does not impact people in the context of the built environment. We know from our school studies that color is an aspect of light that is either generated from a source or reflected from an object. We perceive color through our eyes as a portion of the visible spectrum and differentiate colors and objects from each other based on the hue, value, and chroma of those colors (see sidebar for description of terms). Further, color has been broken down and understood as a very orderly system as first analyzed and developed by Albert Henry Munsell in the early 1900s. As a painter and teacher of art in Boston, Massachusetts, his Munsell Color System was a foundational contribution to the areas of color science and color theory. This was the first system to separate colors by hue, value, and chroma such that they could be perceived as a three dimensional model that allowed for a consistent means to identify humanly perceptible differences in these three different dimensions of color. Color in building design helps define spaces, aids in wayfinding, and elicits varying degrees of personal and emotional responses. 1. Hue: The attribute of the color by which it is distinguished from another color (i.e., blue from red from yellow). 2. Value: Synonymous with the lightness or darkness of the hue. 3. Chroma (or Saturation): The purity or intensity of a hue. 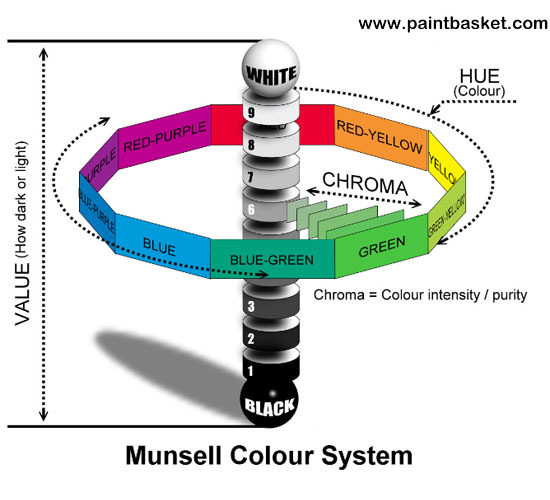 The Munsell Color System assigns each color a place on a twelve-color wheel (originally conceived as 10). 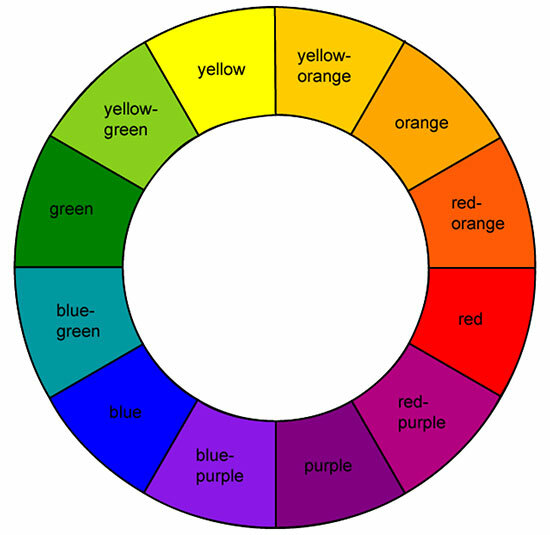 The colors are arranged in a wheel with the three primary hues (red, yellow, blue) separated by three secondary hues (orange, green, violet), and further separated by six tertiary hues between the primary and secondary hues. The hues are then further identified by the value and the chroma of each along a three-dimensional scale. Objectively recognizing color is important and useful in design by providing us with the ability to select and fine tune specific colors used for a particular space. However, there is another aspect of color that is important too, namely that of human perception related to color. A review of some of the literature surrounding color and perceptions produces a variety of theories. For example, researcher Grant Hildebrand of the University of Washington, Seattle has posited, “It cannot reasonably be denied that color matters in our innate perceptions… in a psychobiological interpretation. For example, blues and greens are generally regarded as restful—in our early experiences in the savannas of Africa these colors stood for shelter, water, and vegetable food sources. There are many associations with red as an attention-commanding color—red lights, red flags, etc.” These statements suggest that human beings have been conditioned through the centuries to associate certain colors with certain outcomes and that we can be expected to respond to colors based on those expected associations. Much of this work is based in large part on the field of neuroscience which is the scientific study of the nervous system including the brain and sensory elements such as the retina of the eyes. Perceived color is based on the relative activity of ganglion cells that provide a stream of information to the brain which in turn is involved in the spatial comparison of three opposing processes: light versus dark, red versus green, and blue versus yellow. Dr. Thomas Albright, Ph.D. of The Salk Institute for Biological Studies is a neuroscientist who has devoted significant study to vision as it relates to human perception and behavior. He has demonstrated that our eyes function to receive an image consisting of color, texture, motion, and distance related to something that we view in our external environment. But that image then has to be detected and perceived by the brain to be understood. The meaning of the image is discerned based on things like attention, memory, and emotion. He points out, “Vision is important for social communication, understanding the environment, mediums of communications, and mediums of expression and impression, like art. In principle, there isn’t sufficient information just in a visual image to gain a perception of it, so vision depends on prior experience.” Depending on the meaning that we ascribe to what we see, he asserts that we will then take a corresponding action on that image. In addition to emotional and historical associations, color perception can be impacted by the observer’s age, vision capacity, and mental health. This means that different perceptions can result in different people at different times in their lives and under differing personal circumstances. The design implication of this point is that all spaces cannot be assumed to be treated the same if different groups of people are using them. Rather they need to be designed with a sensitivity to the different color perceptions appropriate to the needs of each group. With all of the above thoughts in mind, let’s look specifically at health-care settings in terms of visual perceptions and color. Numerous theories and studies regarding the psychophysiological effects of color have been undertaken. A comprehensive review of that work was published in 2003 by the Coalition for Health Environments Research (CHER) located in San Francisco. Titled simply, “Color in Healthcare Environments,” its stated purpose was “to review the literature on color in health-care environments in order to separate among common myths and realities in the research and application of color in health-care design.” Some of the relevant findings of this study are summarized in the following paragraphs. Red is commonly thought to provoke an emotional response of arousal in people, but the research indicates that this is not universally true nor is it as dramatic as some suspect.